RESIDENTS of Tabubil town and surrounding communities near the mining township have been urged to be involved in policing during the festive season. North Fly Police Commander Superintendent Joe Puri said this during a police parade in Tabubil town centre when launching Christmas police operations in Tabubil on Friday December 23. 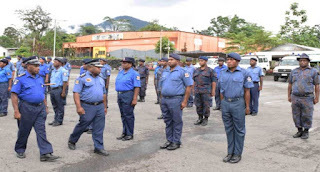 Police officers from Tabubil and Mobile Squad 05 from Mt Hagen participated in the parade. Witnessing the parade was Ok Tedi Mining Limited Managing Director and Chief Executive Officer Peter Graham and other department managers. Supt Puri told the people that it is also their responsibility to do their own policing to assist police maintain law and order and not rely on police men and women to do all the policing work. He stressed that the community needed to work together with the policemen and women to ensure the festive period was celebrated trouble free. He also told the community that illegal activities like gambling and alcohol abuse will only attract other unwanted activities and he urged the community to be honest and put a complete stop to these activities. He reminded the community that an alcohol ban was already in place since Wednesday December 22 to ensure a smooth Christmas and New Year period without any major problems. Supt Puri encouraged the Tabubil community to obey the ban that was in place and celebrate the festive season peacefully with their families. He also thanked OTML for working together with police to maintain law and order in Tabubil and the surrounding communities.